Anyone with poor vision will tell you that it comes with a host of frustrations. You cannot see properly without contacts or glasses, and life is just that much harder than it is for everyone else. Many who experience this effect turn to eye surgery for help. They do their research, see a doctor, and settle on a treatment. Which is often LASIK. However, in the early ’80s and ’90s, many people went with Radial Keratotomy (RK), which is supposed to fix one’s eyesight and allow them to live a normal life. Unfortunately, they aren’t always so lucky. 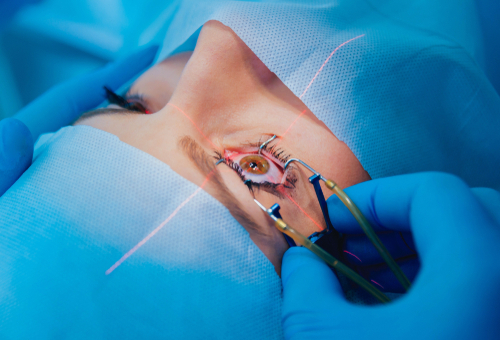 The untold secret of eye surgeries is the complications that frequently come with them. In fact, significant proportions of patients report dissatisfaction with their procedures. The following are four statistics about post-surgery patients that you might find surprising. With Radial Keratotomy (RK) the statistics are even higher. The point is this: Treatments like LASIK and Radial Keratotomy (RK) are not perfect. Post-LASIK, RK, PRK, and other eye surgery complications are very real. If you choose to get a procedure, you could be a victim. That’s not to say that you should never consider an eye surgery. Instead, you should simply understand the risk that comes with them and have a post-surgery plan in case your treatment does not go as planned. If you have already had eye surgery, you may be experiencing symptoms. Some of the most common ones are blurry vision, double vision, ghosting, glare, halo effect, and starbursting. Provide Personalized Treatment – In the course of a day, Dr. Azman will see many patients. One might need contact lenses after Radial keratotomy (RK) eye surgery, while another will require an entirely different treatment. What makes him such an effective doctor is his understanding that no solution is one size fits all. Instead, he treats each patient as a member of his own family. He starts with an in-depth conversation about medical history and symptoms. Next, he discusses treatment options with the patient, helping them understand each of them entirely. The result of this is an effective treatment plan that gives patients the highest level of care possible. Solve Issues Other Doctors Cannot – One thing that Dr. Azman frequently hears from patients is that they have been to multiple doctors before and have been left unsatisfied. It is no mystery why. Many people will see a surgeon for their initial treatment, but find that this doctor is not equipped to help with post-treatment complications. Next, they’ll see a typical eye doctor, who also won’t have any answers. Their last stop is at Dr. Azman’s office, where they finally get the treatment they need. The reason is that these other doctors either have too general of knowledge or they specialize in the wrong area. Dr. Azman is the perfect option because he has decades of experience in this specific field. Provide a Variety of Options – There is no single treatment option that we use to help our patients. Instead, we tailor our treatment to each individual that walks through our door. The ones that we most commonly use are soft contact lenses, RGP hard lenses, custom soft lenses, hybrid contact lenses ( SynergEyes), scleral contact lenses, custom scleral lenses, PVR PROSE, EyePrint PRO, and Boston Scleral lens. That being said, we have more tricks up our sleeve for more complicated cases, so no matter what you need, we will have a solution. One thing that we see over and over again at Dr. Azman’s office is people that are deeply discouraged. The reason is that they have tried and tried to fix their vision issues, but to no avail. They come to Dr. Azman as their final option and hope for the best. Another thing we see again and again is the look on those people’s faces when they finally get the treatment they need. This is why we do what we do, and there is nothing more satisfying than a happy patient. If you’re experiencing any adverse symptoms after your eye surgery, don’t think that you need to live with them. Instead, take control and see Dr. Azman. When you do, you will be one step closer to solving your issues and taking your life back. This entry was posted in Uncategorized on October 5, 2018 by Post LASIK Doctor. 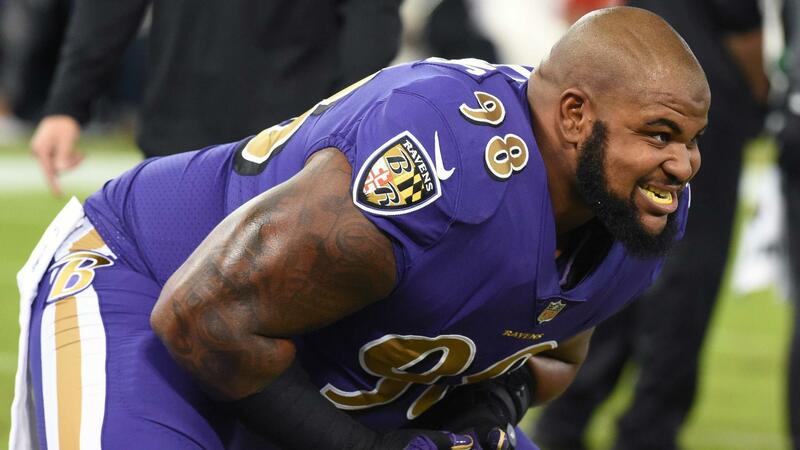 Brandon Williams sat in his usual seat near the back of the Ravens’ meeting room, but something was wrong. The dry-erase board down front had dissolved into a blur of colors and squiggles. Williams squinted and blinked furiously but couldn’t bring the image into focus. 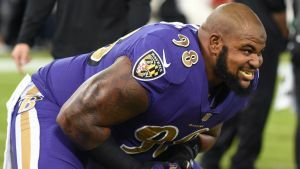 “Like I got sand in my eye almost,” the Ravens defensive tackle recalls. Like many elite athletes, he had been able to count on near-perfect vision for most of his life. But seemingly overnight, he could not achieve this most basic of physical functions. Williams finally went to his doctor and after a round of tests, learned he was suffering from keratoconus, a degenerative condition in which the corneas weaken and eventually bulge out, leading to blurry or distorted vision. This entry was posted in cross linking, cxl, Keratoconus, Scleral lenses on March 23, 2018 by Post LASIK Doctor. Is There Hope For Post-LASIK Complications? LASIK has saved millions of people with refractive eye problems around the word. The objective of this procedure is to restore to good vision and never be bothered with wearing contact lenses or eyeglasses. Regrettably, not all people who have undergone this procedure are free from the complications of LASIK. The reported complications include blurry vision, dry eye, double vision, glare, halos and more. Initially, some of these side effects are experienced during the first few days, or even weeks after the surgery. However, as the months and years progress many are left with these life long side effects. Prolong dry eye disease, blurry vision, double vision and the rest of the complications after LASIK can cause stress and depression. Although, according to reports, only one percent experience serious complications from the procedure, other reports indicate mild-moderate post LASIK complications to be as high as 40%. If you have experienced the severe or moderate complications of post-LASIK surgery, the good news is, there is hope for you. Seeking another eye doctor to treat the complications of the post eye restoration procedure is a common practice among patients suffering from the complications of the surgery. The fear of having to experience another blow from their previous eye doctor is dreadful, which is why patients are on the go to have their eyes check from one doctor to the another. There is nothing wrong with this scenario – doctor shopping; second opinions are necessary. Seeing more than one doctor is draining, financially and physically, going to and fro to their respective clinics and be subjected to a series of eye tests again. What is wise and practical is to nail down one reputable eye doctor who specializes in the clinical pathway to treat the complications of the post-LASIK complications. This entry was posted in Post Lasik Dry Eye, Post LASIK, PRK, and RK Problems on March 8, 2016 by Post LASIK Doctor. Stevens Johnson syndrome (SJS) and the more severe variant of the disease, toxic epidermal necrolysis syndrome (TENS), are intense autoimmune sensitivity reactions to infections or medications that primarily affect the skin and mucus membranes, including the eyes. Patients with Stevens-Johnson Syndrome have a tendency to have ocular difficulties including dry eyes, eye pain, light sensitivity, scarring, and corneal erosion. Global Complex Eye Care has helped many patients restore vision and quality of life transformed with his innovative treatments. PVR PROSE Lenses are large-diameter gas permeable prosthetic lens specially designed to vault over the entire corneal surface and rest on the “white” of the eye (sclera). In doing so, scleral lenses functionally replace the irregular cornea with a perfectly smooth optical surface to correct vision problems caused by Lasik failures, post-surgical complications, and other corneal irregularities. PVR PROSE Lenses are designed to vault the corneal surface and rest on the less sensitive surface of the sclera, these prosthetic lenses often are more comfortable for a person with corneal irregularities. A special liquid fills the space between the back surface of the lens and the front surface of the cornea. This liquid acts as a buffer and protects the compromised corneal tissue. PVR PROSE Lenses are designed to fit with little or no lens movement during blinks, making them more stable on the eye, compared with traditional corneal gas permeable lenses. These lenses are almost always very comfortable and the vision provided by them is extremely good. The great majority of patients are able to wear their PVR PROSE Lenses almost all of their waking hours without problems. Dr. Irwin Azman prescribes PVR PROSE Lenses for a variety of hard-to-fit eyes, including patients with Stevens-Johnson Syndrome, Radial Keratotomy (RK) and Lasik Complications, Keratoconus, Corneal Ectasia, Post-Surgical Vision Loss, and Pellucid Marginal Degeneration. This entry was posted in PROSE Lens, PROSE Treatment, Stevens Johnson Syndrome (SJS) on March 30, 2015 by Post LASIK Doctor. Our PVR PROSE Treatment is a process that uses a prosthetic device, like a scleral lens, to replace the ocular surface to provide functional vision to complex corneal conditions. Utilizing our knowledge, experience, and technology, like the Vistante- Optical Coherence Tomography OCT, we are able to customize a prosthetic PROSE lens, with the precise measurements down to the micron. With an exact fit, there is proper movement, comfort, and perfect vision. PROSE Lenses are large-diameter gas permeable contact lenses specially designed to vault the entire corneal surface and rest on the “white” of the eye (sclera). In doing so, PROSE scleral lenses functionally replace the irregular cornea with a perfectly smooth optical surface to correct vision problems caused by, keratoconus, Lasik failures, post-surgical complications, and other corneal irregularities. Because PROSE Lenses / scleral lenses are designed to vault the corneal surface and rest on the less sensitive surface of the sclera, these lenses often are more comfortable for a person with corneal irregularities caused by keratoconus and other corneal irregularities A special liquid fills the space between the back surface of the lens and the front surface of the cornea. This liquid acts as a buffer and protects the compromised corneal tissue. Scleral lenses are designed to fit with little or no lens movement during blinks, making them more stable on the eye, compared with traditional corneal gas permeable lenses. These lenses are almost always very comfortable and the vision provided by them is extremely good. The great majority of patients are able to wear their scleral lenses almost all of their waking hours without problems. Dr. Irwin Azman, Keratoconus Specialists in Maryland, prescribes PVR PROSE Lenses for a variety of hard-to-fit eyes, including patients with Stevens-Johnson Syndrome, Radial Keratotomy and Lasik Complications and Lasik failures, keratoconus, Corneal Ectasia, Post-Surgical Vision Loss, and Pellucid Marginal Degeneration. Dr. Irwin Azman specializes in keratoconus, LASIK failures and other corneal irregularities neither avoids nor declines the challenge of prescribing the most difficult cases. This entry was posted in Ectasia, Keratoconus, Pellucid Marginal Degeneration (PMD), PROSE Lens, Scleral lenses on March 30, 2015 by Post LASIK Doctor. PVR PROSE Lenses are helpful in a lot of post LASIK complications and side effects including corneal ectasia, irregular astigmatism, dry eyes, etc. PVR PROSE Lenses don’t come in contact with the cornea of the eye, therefore they’re helpful in patients having sensitive or irregular cornea, where soft and conventional contact lenses can’t be used. There is a film of tear between the PVR PROSE Lens and the cornea, which provides a cushion as well as helps in uniform refraction while the light rays pass through the lens, cornea and the gap in between. PVR PROSE Lenses can be helpful in patients suffering with irregular astigmatism after the LASIK procedure. If you’re having any complications after LASIK procedure consult our specialist to discuss the post Lasik side effects in your case and the best possible treatment options for you. This entry was posted in Ectasia, Glare, Halos, Overcorrection, Post Lasik Dry Eye, Post LASIK, PRK, and RK Problems, PROSE Lens, Radial keratotomy, Scleral lenses, Starbursts on March 30, 2015 by Post LASIK Doctor. Radial Keratotomy is a refractive surgery that’s used to correct nearsightedness (myopia). Typically the patients undergoing radial keratotomy expect to get rid of contact lenses and eyeglasses completely. Most of them do get rid of them in fact, however in some cases the complications may develop and the patients may need contact lenses to restore the visual acuity and to get rid of any visual disturbances that happened as a result of radial keratotomy. Radial keratotomy (RK) incisions may heal in a way that it results in greater myopia reduction, i.e. over correction, resulting in hyperopia. 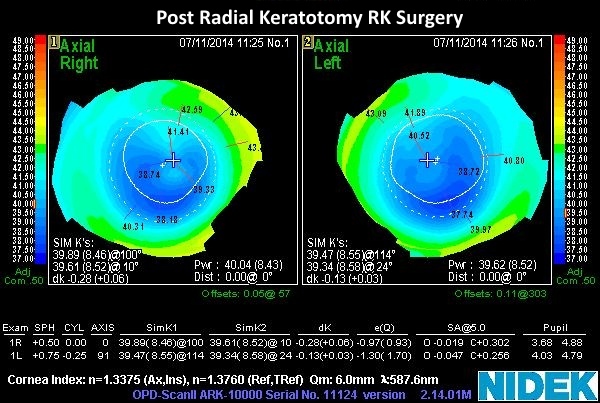 A significant number of patients undergoing radial keratotomy experience a shift toward hyperopia. During the first month after procedure, slight visual fluctuations are common. They can be attributed to wound healing and variable depending on number of incisions and their depth. However some patients may develop constant hyperopia or other visual disturbances after the RK eye surgery and may need contact lenses for management. Visual acuity and performance gets affected in any procedure where there is under correction, overcorrection, epithelial growth, wrinkling, striae, etc. Any complication that causes irregularity in corneal surface can cause refractive errors and affect visual acuity. These irregularities may leave the cornea unable to be treated surgically and rehabilitative contact lenses may be the only option available to correct these errors. Soft contact lenses can be of benefit in some of the post refractive keratotomy patients, however it may not be suitable for many cases. Scleral contact lenses rest on the sclera of the eye without getting in contact of the cornea; therefore they are not affected by the corneal irregularities and maintain their shape. The scleral contact lenses are made from the material that’s hyper permeable to oxygen. The scleral contact lenses maintain the saline reservoir between the cornea and the lens that bathes the cornea along with cushioning it. Scleral contact lenses are helpful in correcting both nearsightedness and farsightedness along with astigmatism too. Rigid gas permeable contact lenses, as the name suggests, are rigid and oxygen permeable along with being comfortable as compared to their predecessors. Note that they’re rigid, not hard. Gas permeable contact lenses can be made in any power possible and correct nearsightedness, farsightedness and astigmatism too. Rigid gas permeable contact lenses are smaller than scleral and soft contact lenses and therefore provide better handling and comfort. Global Complex Eye Care was specifically designed, equipped, and staffed to provide patients with nothing but the finest in professional eye care. As Post Radial Keratotomy RK Surgery Specialists, we have successfully treated patients with experiencing side effects and complications from Radial Keratotomy RK Eye Surgery , Keratoconus, LASIK side effects, Pellucid Marginal Degeneration, Stevens-Johnson Syndrome, and other irregular corneas. Optometrists and Ophthalmologists from all over Maryland and surrounding states refer patients to Dr. Irwin Azman. This entry was posted in Glare, Halos, Overcorrection, Radial keratotomy, Starbursts and tagged Radial Keratotomy on February 23, 2015 by Post LASIK Doctor. Post Lasik ectasia of the cornea is one of the most severe complications of Lasik (Laser in situ Keratomileusis). The Lasik procedure permanently weakens and thins out the cornea, resulting in progressive changes in the cornea such as steepening or bulging, called ectasia. Corneal ectasia results in the visual deterioration. Keratoconus and post Lasik ectasia (keratectasia) are histologically two different processes. Keratoconus is a corneal disorder that isn’t related to surgery and affects both eyes. It begins usually in late teenage years or around puberty. Keratectasia is a result of corneal manipulation during surgery, like Lasik. If the patient didn’t have keratoconus before surgery and didn’t have any family history of the disease, then the post Lasik weakening of the cornea is probably keratectasia (ectasia). Preferably scleral lenses and rigid gas permeable contact lenses are chosen for the patients. However if they are intolerant to the rigid gas permeable lenses they can be advised the tandem soft contact lenses, hybrid contact lenses and the scleral contact lenses as the next options. Intracorneal ring segments (ICRS) are used in post Lasik ectasia patients having thin cornea that can’t tolerate the contact lens. The size, symmetry, location and number of segments to use are dependent on the individual case and surgeon’s decision. The anterior thin layer of cornea is weakened during the flap creation. Most of the cross linking effect occurs in that almost 200 microns of anterior layer of cornea. Cross linking has been claimed to stop the progress of ectasia therefore corneal collagen cross-linking (CXL) can be used to stop post Lasik ectasia from getting worse. Some patients might need and benefit from the combination therapies including intracorneal ring segments or corneal crosslinking or any other combined therapy. Penetrating keratoplasty (PKP) is used as the last resort in patients with post Lasik estasia. Global Complex Eye Care was specifically designed, equipped, and staffed to provide patients with nothing but the finest in professional eye care. As Post LASIK specialists, we have successfully treated patients with Post Lasik Ectasia, Keratoconus, LASIK Dry Eye and other side effects, Pellucid Marginal Degeneration, Stevens-Johnson Syndrome, and other irregular corneas. Optometrists and Ophthalmologists from all over Maryland and surrounding states refer patients to Dr. Irwin Azman. to schedule your complimentary telephone consultation. 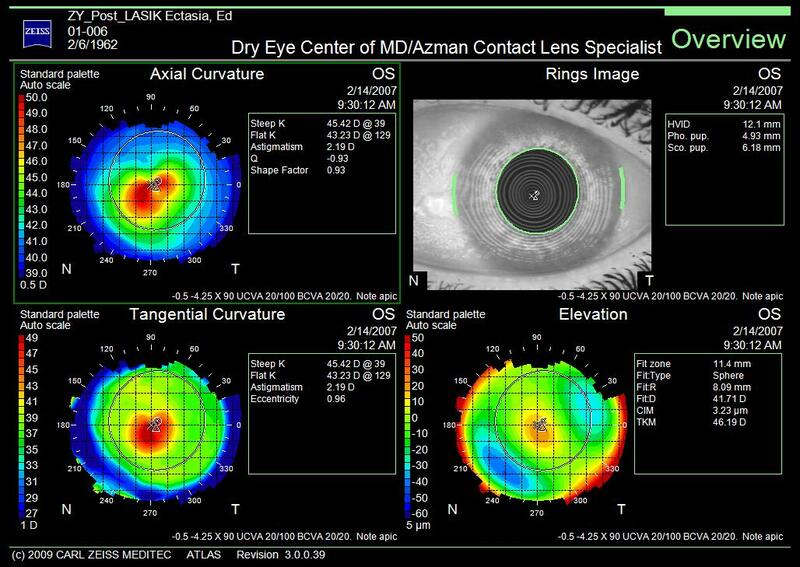 This entry was posted in Ectasia, Glare, Halos, Keratoconus, Post Lasik Dry Eye, Post LASIK, PRK, and RK Problems, Scleral lenses on February 20, 2015 by Post LASIK Doctor.